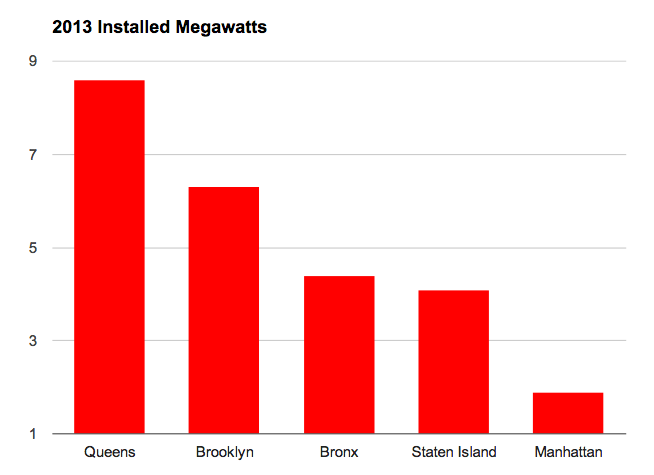 Solar is booming across the country, even in the most unlikely of places — New York City. 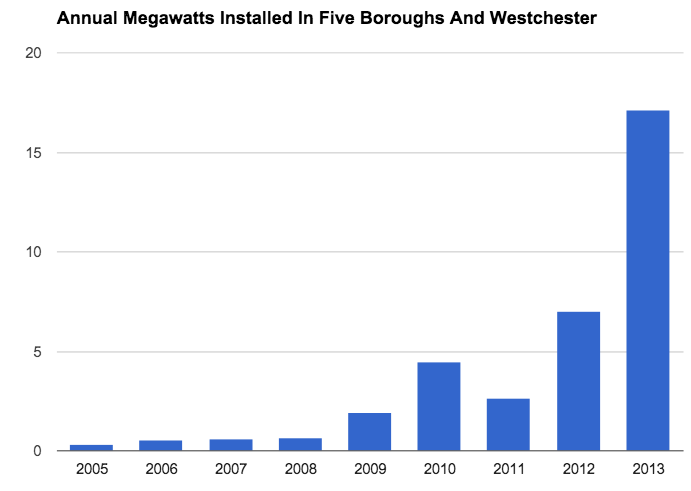 According to ConEd data provided to Business Insider, solar capacity in the five boroughs, plus Westchester County, grew 93% in 2013 to 35.3 megawatts, the most ever. Westchester led the way overall in 2013, while Queens took the No. 1 spot among the 5 boroughs. What's going on in Queens? Mostly the prevalence of low, flat roofs, especially among commercial buildings, which comprise the majority of the borough's solar installations. This is also why Manhattan came in dead last. Jolly says these installations — which are, after all, miniaturized, isolated power plants — could provide temporary relief during a power outage. "We've added some two-way communications, give operators ability to control network protector allow certain amount of back flow," she said. For now, in the short-run, the new customers won't see any benefit on their electric bills unless they can help meet demand during peak usage times. And the city is also inherently limited in the amount of solar it can install by the shape of its rooftops. But the trend is unmistakable.